LOS ANGELES—Dodgers players told reporters Friday they have been playing harder than usual the last few weeks in hopes of reuniting their parents—Frank and Jamie McCourt. 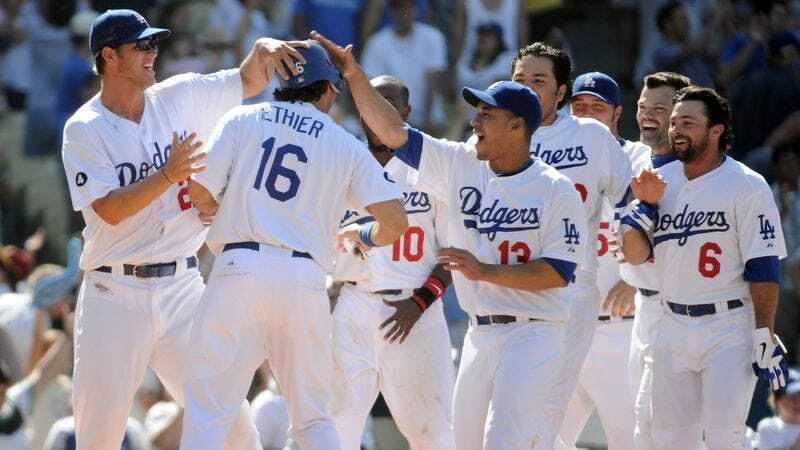 "Maybe if we keep hitting homeruns, it'll make them realize how much they miss us and love us and then they'll come back," said outfielder Andre Ethier, who credited his 23-game hit streak and .379 batting average to "missing Mom and Dad real bad." "We're all going to try extra hard tonight because we forged apology letters to and from our parents and told them to meet at the game. Casey [Blake] reserved their tickets. Gosh, I hope this works." Several players confessed they want the McCourts to take notice of their winning ways sooner rather than later, as none of them liked the creepy adoptive father who keeps telling them to just call him "Bud."